Some very good reports this week with some great warmer weather over the past few days. 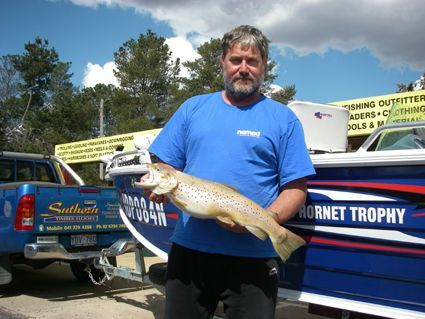 Lake Eucumbene is right on last seasons high and is going to be great for bait and fly anglers from the shore. Midges are about and will provide some fantastic fly fishing very soon. Trolling in the lakes has been outstanding for some. 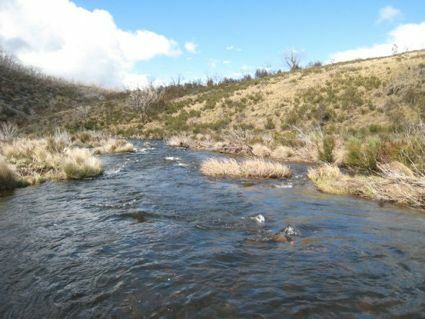 Rivers have had another top up with a good storm on Monday afternoon and the Eucumbene and Thredbo are still holding good numbers of fish. could you please post this urgent request on the fishing report for next week. obviously fallen off in that vacinity. fly-caught fish with the rod. not to be late for his wedding! 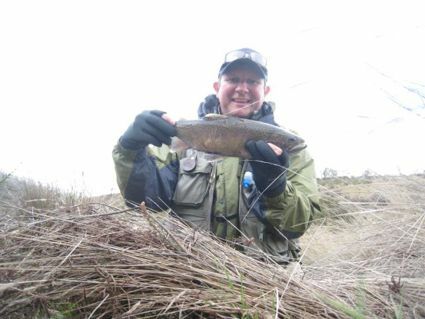 The Thredbo and Eucumbene rivers have fished well again this week. 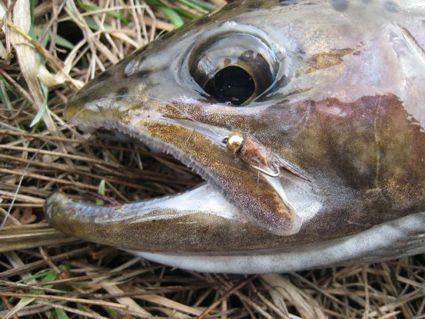 Plenty of fish in both rivers have been seen, lost, caught and released. Most have been rainbows but there were a few nice browns caught as well. Glo bugs and Beadhead or weighted Nymphs continue to be the main fish takers. 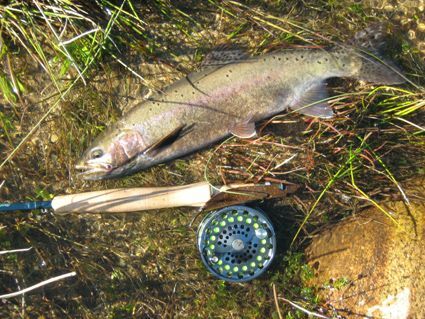 Dry fly fishing is starting to improve with the warmer weather. There is a good chance of termite falls in the next couple of weeks. Some brown, red and black ants are a must in the box at this time of year. They usually fall in the evenings and the following morning fish can be found mopping them up. They provide some exciting fishing. *I got up to Providence Flats yesterday (Sunday) at about lunch time. There was still quite a few fish in the river and I managed to pick up 8, dropped 3 or 4, missed a number of others and even got busted by a better fish. In this was one brownie of about a kilo on the nymph. All the rainbows ate the egg imitation. All in the space of about 4 hours, overall an enjoyable Sunday afternoon. Lake Eucumbene:- Is set to fire again this Spring. As mentioned the lake level is right on last seasons high. Those that fished the lake last season will remember the huge amounts of aquatic insects, caddis, corixa, snails, damsel nymphs, midges, mudeyes etc that were in abundance, as the lake rose into the grass, and the subsequent rainbows that came in close to feed of an evening and morning. Think locations like Rushy Plains, Seven Gates, Buckenderra, Brookwood, Braemar, Cobrabald, Waiunui, Coppermine, Collingwood, Yens, Wangrabelle, Springwood all these areas are and will continue firing for a good couple of months now both with polaroiding and evening rises. 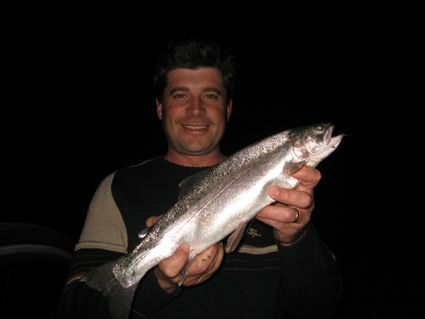 The fishing has already improved in Eucumbene with several reports of fish cruising the shallows in the early mornings. Reports of fish starting to rise early and late in the day is great news and with the water rapidly rising also there will be more fish searching the shallows. Woolly Buggers, yabby patterns, Mrs Simpsons, Hammills Killer all work well in these situations. Midge pupa cast at rising fish work a treat as do stick caddis. *Fourteen year old Brad Corradini from Kiama had a great four days on the Eucumbene river catching twenty fish on Glo Bugs and Celtas. The fish averaged around 35-40cm. He only kept two for the four days. Great fishing. Thought I would drop a line to share our great four days on Jindabyne. We camped opposite the Kalkite boat ramp and trolled the top end of the lake for 19 fish. We landed twelve browns all over 50 cm's of varying condition, best sized fish we have had for a good while. Young Ben Lamb, on only his second trip, thinks catching big browns is easy while my son Matthew also had plenty of luck. We took most of the fish in 12 - 20 foot of water with a couple of Peter Stuckey lures in gold and fluro yellow. The wind and rain made bait fishing on shore difficult but we did land a couple on Lime Twist Powerbait. Even a flat car battery, when we got back to the ramp, could not spoil our weekend and the Cooma NRMA bloke was great. 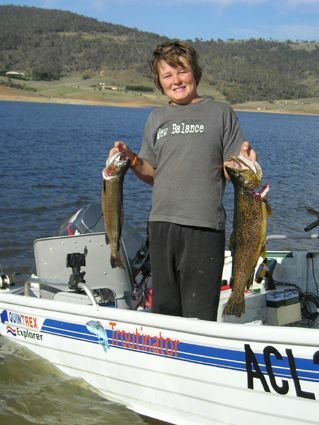 *Max Suthern from Canberra had a good session at Jindabyne on Saturday. He caught fourteen fish, mostly browns to 3kg. #66 Tassie was the best lure. Max if you are reading this you left the lures you bought in the shop on the weekend too. Turned into a nice night, went to 7 gates, just one on a scrubworm, looks VERY good down there with the water up over the grass. 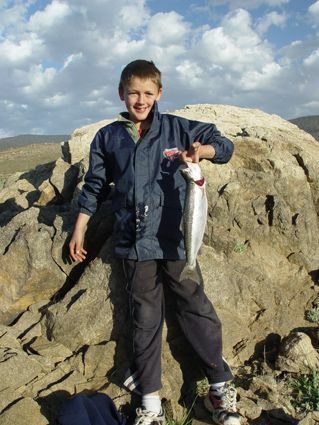 *Hi guys, took my youngest son Tyler Bolitho age 9 to Jindabyne last weekend for a bit trout fishing to catch him his first trout. 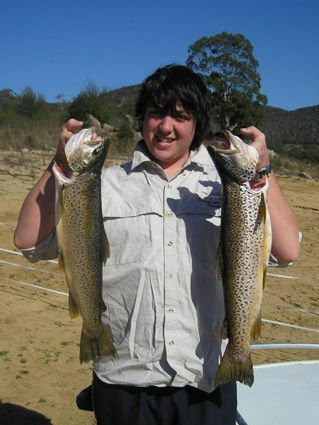 Trolled around the Snowy river arm for his first brown trout 1.5kg and in beautiful condition, caught on a Rapala trout pattern. He also caught three nice rainbow from 700gm 1.2kg on Powerbait in lime green & orange and red, he was very happy and didn't want to go home on Sunday, when it started to rain. We persisted for a few more hours for a couple more fish, it was a great bonding session.